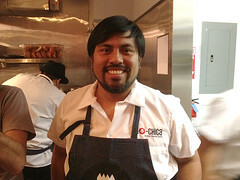 Ricardo Zarate, one of my favorite chefs (Picca Peru) officially opens his new Mo-chica restaurant in downtown L.A. tomorrow, May 30th. Peter and I were invited to check out the new space and menu at a “friends and family” preview dinner, where we both tried ALPACA (photos below) for the first time! The official grand opening includes a street artist, ribbon cutting and Peruvian dancers. 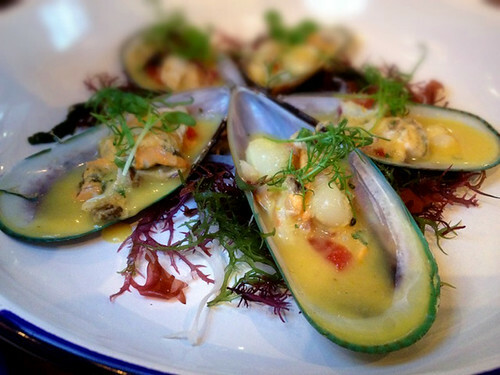 Choritos a la Chalaca: Grilled chopped mussels, prawns, squid, tomato choclo salsa. 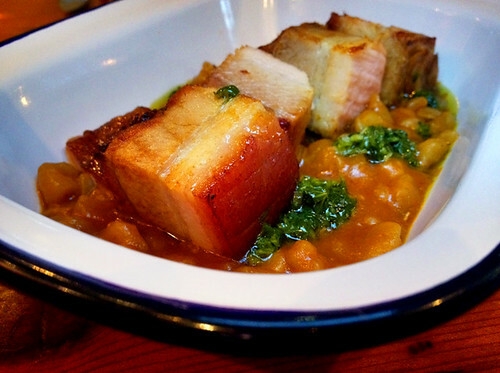 Carapulcra: Peruvian sun dried potato stew, crispy pork belly, chimichurri. 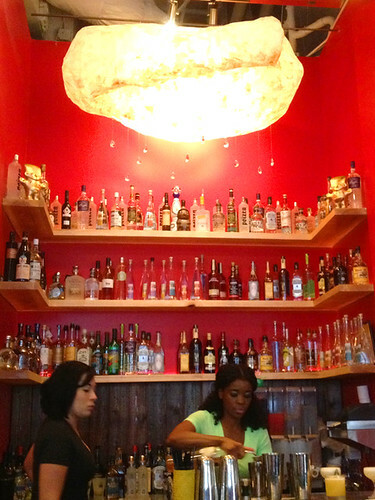 The new Mo-chica has a full bar. 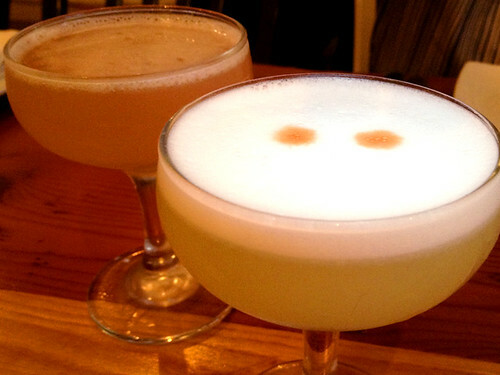 Dogfather (front) aka Pisco Sour: Pisco, egg white, fresh lime & lemon juice, cane syrup sugar, angostura bitter. Papa Don’t Peach: Banks Rum, Fresh Peaches infused w Calvados, Peach Bitters, Simple Syrup, fresh lemon juice. 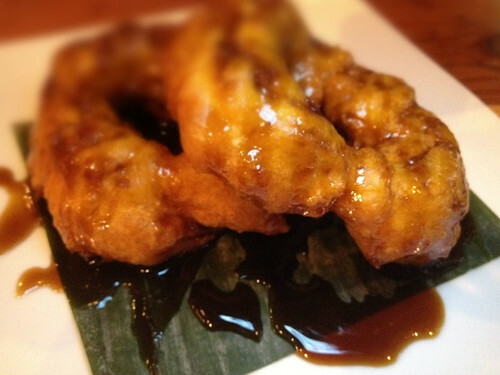 Dessert: Kabocha Pumpkin Beignets w Chancaca Sauce (sweet sauce made of raw unrefined sugar crystallized with honey). Mo-chica is a vibrant, urban restaurant serving Chef Ricardo Zarate’s modern interpretations on traditional Peruvian comfort food. Originally built in an unassuming food court in downtown Los Angeles, the restaurant’s humble setting proved a stark contrast for the innovative cuisine served. 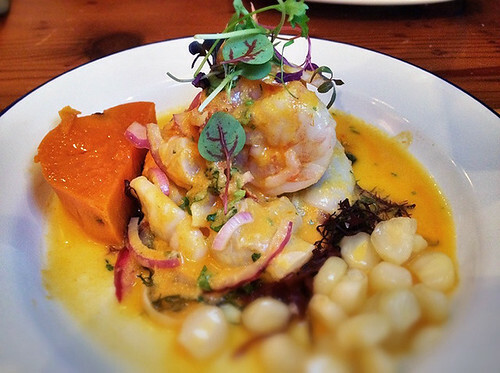 Chef Ricardo Zarate, a good-humored Lima native who trained at some of London’s most celebrated restaurants for 12 years, opened Mo-chica in the summer of 2009 as his first solo endeavor. The restaurant immediately received recognition from both local and national audiences, including Jonathan Gold and the head honchos at Food & Wine. 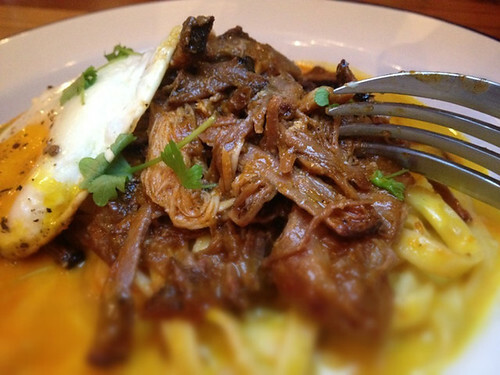 After opening Picca in 2011 and fueled by the unprecedented momentum of the restaurants’ successes, Zarate resurfaced his dream for Mo-chica—one he wasn’t able to fully materialize with the original location due to limited resources. 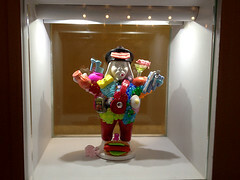 The chef found a larger space downtown on 7th and Grand that could embody his original vision; the open, industrial-esque restaurant features concrete floors, vibrant-hued walls tagged with graffiti (thanks to local artist Kozem), whimsical touches—including Peruvian figurines customized by some of the city’s culinary tastemakers such as Ludo Lefebvre, Nancy Silverton, and Evan Kleiman—and sneakers suspended from the ceiling. Dining Date: 5/27/12 Friends & Family Dinner (gratis). 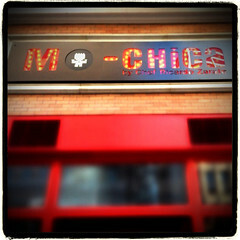 Many thanks and CONGRATS to Ricardo, Stephane, Jorge, Team Mo-chica, Shawna & all! Open for lunch and dinner 7 days a week. 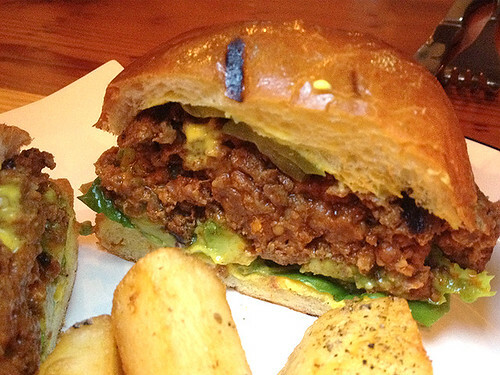 Valet parking available after 7 p.m.
Read “Ricardo Zarate Wants To Introduce You To Alpaca Meat” by Grub Street L.A.